There are few cases in American history as well known as Sacco and Vanzetti, and perhaps none of them were as controversial or socially charged as the trials against the two Italian immigrants in the early 20th century. The two avowed anarchists were ultimately tried and executed for murder and armed robbery, but the case said as much about the society trying them as it did about their guilt or innocence. Nearly 90 years later, there is still a heated debate over whether the two men, who arduously asserted their innocence, were actually guilty, but what is clear is that many Americans at the time believed they were being unjustly accused based on anti-Italian prejudice and disdain for their political beliefs. After they were arrested and charged, a number of respected celebrities lobbied on their behalf, including Albert Einstein, H.G. Wells, and future Supreme Court justice Felix Frankfurter, which compelled Massachusetts’ governor to appoint a commission to investigate the case even after Sacco and Vanzetti had been convicted and sentenced to death. Ultimately, however, the commission upheld the finding of guilty, and the two men were electrocuted to death in August 1927. 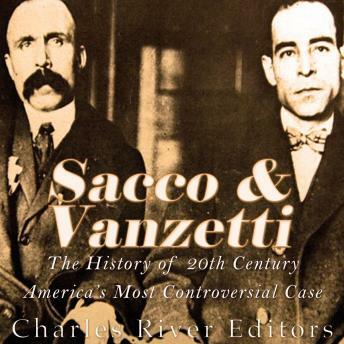 Sacco and Vanzetti: The History of 20th Century America’s Most Controversial Case chronicles the notorious trial and execution of the two Italian anarchists.